The Akshardham or Akshardham Temple or Swaminarayan Akshardham Temple Complex is one of the most sought after tourist attractions in Delhi. It is a predominantly is Hindu Mandir and a spiritual cultural campus but has been very popular among tourists coming from the different parts of the world because of its modern and stunning architecture. When you will visit Swaminarayan Akshardham you will have a wonderful opportunity to see the millennia of traditional Hindu and Indian culture, spirituality, and architecture. Renowned internationally for its unique and beautiful marble works and stunning architecture, the Akshardham Hindu Temple Complex attracts approximately 70% of all tourists who visit Delhi. The temple complex lies on the banks of sacred Yamuna River adjacent to the 2010 Commonwealth Games Village in East Delhi. The main temple within the complex was constructed according to the Vastu Shastra and Pancharatra Shastra. Declared as the Largest Hindu Temple Complex in the world, the Swami Narayan Akshardham Complex features Mandir, Abhishek Mandap, Exhibitions, Sahajanand Musical Water Show, and a Thematic Garden. There are three exhibitions in the complex namely Sahajanand Darshan (Hall of Values), Neelkanth Darshan (an IMAX film on the early life of Swaminarayan as the teenage yogi, Neelkanth), and Sanskruti Darshan (cultural boat ride). Akshardham Mandir: Undoubtedly, the main attraction of the Swaminarayan Akshardham Complex is the Akshardham Mandir. Intricately carved with beautiful flora, fauna, dancers, musicians, and deities; the Mandir rises 43 meter high, spans 96 meter wide, and extends 109 meter long. The beauty and architecture of the Mandir will amaze you significantly. You will have a brilliant opportunity to see here an excellent blend of architectural styles across India. The temple is entirely built from premium quality sandstones and marbles including famous Rajasthani pink sandstones and Italian Carrara marbles. It is very interesting to know that there is no uses of ferrous metals and has not support from steel and concrete. There are 234 intricately carved pillars, 9 beautiful domes with decorated ceilings, and 20,000 statues (murtis) of saints (sadhus), devotees (bhakts), and acharyas (gurus). The temple is dedicated to Bhagwan Swami Narayan. You will see a beautiful murti of Swami Narayan Bhagwan under the central dome of the temple. The height of the status is 3.4 meter. The statue of Swami Narayan is surrounded by images of faith´s family of acharyas either in a posture of service or in a devotional posture. Each and every statue inside the temple is made of Panchdhatu (five metals) in accordance with Hindu Tradition. There are also statues of Hindu Gods and Goddesses inside the temple. You can see beautiful statues or murtis of Radha Krisha, Gauri Shankar, Sita Ram, and Laxmi Narayan. Seeing beautiful murtis inside the temple will give you a peaceful and divine experience to cherish for life time. Gajendra Peeth: The Gajendra Peeth is a unique and appealing feature of Swami Narayan Akshardham Temple which will amaze you significantly. It is an elegantly constructed plinth paying tribute to the elephants for their vital role and importance in Hindu culture, tradition, & India’s history. Exhibitions: Exhibitions are among most popular features of Akshardham Temple Complex. Exploring different exhibitions at the temple complex will provide you a wonderful experience to cherish for life time. You will have a golden opportunity to know about Hindu culture, tradition, and India’s history while exploring the different exhibitions. Sahajanand Darshan (the Hall of Values), Nilkanth Darshan (Theatre), Sanskruti Vihar (Boat Ride), Colorful Musical Fountains, and Gardens of India are exhibitions which you will never want to miss on your Akshardham Temple visit. 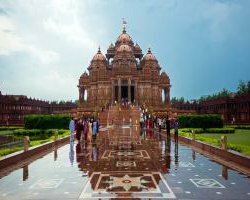 Other Attractions: Apart from aforementioned attractions within the Akshardham Temple Complex, there are several other attractions and features which will amaze you significantly. Yogi Hraday Kamal (a beautiful lotus shaped sunken garden), Nilkanth Abhishek, Narayan Sarovar, and Premvati Ahargruh (Premvati Food Court) are additional features at Swami Narayan Akshardham Temple.